My Year Of Star Trek: Fan Girl Of The Day! Fan Girl Of The Day! Well, this is pretty cool: A while back I was nominated for Fangirl of the Day over at Her Universe and, today, I got it! As a chick who predominately shops in the men's section for her geek apparel, I'm so glad Her Universe came along. Also, this blog recently won an award over at A Peek At Karen's World! My Year Of Star Trek is the "Best Kept Secret," which I rather like. I haven't been around quite so much lately but I have good reasons for this. I'm in the next-to-last stages of pre-production for my first novel release and, as I was getting ready to send the edited manuscript back to the publisher, I realized (in the eleventh hour) that the artwork needed a change. This book has quite a lot of art inside and I'm doing all of it. As I was prepping everything, I discovered that I needed to go back and re-do some of the pieces for consistency. I've been working on this nonstop about 10 hours a day. Unfortunately that doesn't leave much time for blogging. However, I did get a chance to re-watch The Trouble With Tribbles last night! I've seen this episode countless times and I know that I always love it and yet it always surprises me with how good it is. Even though the story is about a bunch of purring furballs taking over a space station, the humor is pretty sophisticated. Every exchange plays out to a humorous, often unexpected conclusion--like what Scotty's willing to get in a fight over--and Kirk, Spock, and McCoy are at their very best. The entire barroom brawl is reminiscent of a 60's prime Blake Edwards bit and Cyrano Jones is the perfect villain. The huckster's bubbly, flamboyant nature hides his underlying ability to create real danger making him a great foil, not only for Kirk, but for the Klingon's as well. He's more a force of nature than an insidious character and that works perfectly for The Trouble With Tribbles. I haven't had much time to get back into Trek lately and I've missed it. It was really great to come back to it with this classic episode. Last year on this day I drew the Mugato for the third Young Naturalist illustration. 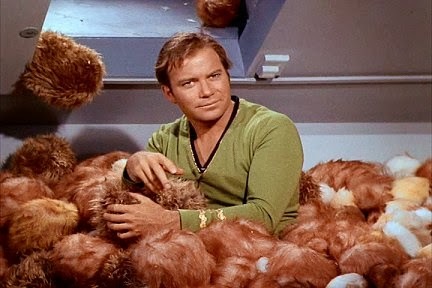 The Trouble with Tribbles is my very favorite episode. And congratulations on your win! It was definitely deserved!